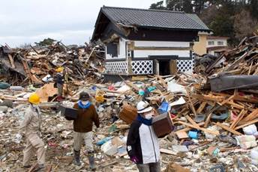 As well as the terrible human cost, the earthquake and tsunami that devastated the Pacific coast of northern Honshu in March 2011 had a major impact on cultural heritage. In the first instance a number of museums, stores and other facilities were directly damaged, and great quantities of heritage materials, both public and personal, were lost. This initial impact was to an extent mitigated by a programme of ‘cultural heritage rescue’. A second impact has been on buried archaeological sites and the important remains they contain in advance of the redevelopment of the region. The background to archaeological activities in the region in the light of the disaster was introduced in a special section in the journal Antiquity in 2013, and in Current World Archaeology in autumn 2011. This seminar will examine the ongoing implications of the redevelopment of the region, and the significance now attached to buried archaeological remains in re-affirming battered community identities. Yoshio Kikuchi is Professor of Archaeology at Fukushima University. A specialist on the archaeology of the kofun (burial mound) period (3-7 centuries AD) in the Tohoku region, he has been actively involved in rescuing cultural heritage in the area affected by the disaster, especially in the vicinity of the stricken Fukushima nuclear power station. He has published extensively on Kofun culture and society and on the regeneration of cultural heritage of Fukushima. Yoshio Negita is Chief Archaeologist at the Agency for Cultural Affairs of the Government of Japan. He was closely involved in coordinating the national archaeological response to the crisis. As well as having responsibility for the implementation of archaeological legislation and guidelines across Japan, Negita coordinates the annual exhibition Hakkutsu sareta nihon retto [The Japanese archipelago excavated], which for the past twenty years has toured Japan for six months each year exhibiting the most significant discoveries from the year before. Katsuyuki Okamura works at the Osaka City Cultural Properties Association. He has just completed a year seconded to the Archaeology Section of Fukushima Prefectural Government, where he directed archaeological excavations in advance of redevelopment projects in the regions affected by the disaster. He has recently published a book on Public Archaeology (Tokyo, Doshisha, in Japanese). Simon Kaner is Head of the Centre for Archaeology and Heritage at the Sainsbury Institute, and Director of the Centre for Japanese Studies at the University of East Anglia, Norwich. He studied Japanese archaeology at the universities of Cambridge and Kyoto. From 2011 he has led the Sainsbury Institute project on Cultural Properties Loss. His publications include The Power of Dogu: Ceramic Figures from Ancient Japan (British Museum Press). He received a Daiwa Award in 2011 to conduct research in cultural heritage rescue in Fukushima.